The German Luxury carmaker which is already at numero uno position among its competitors in India is not keeping quite. 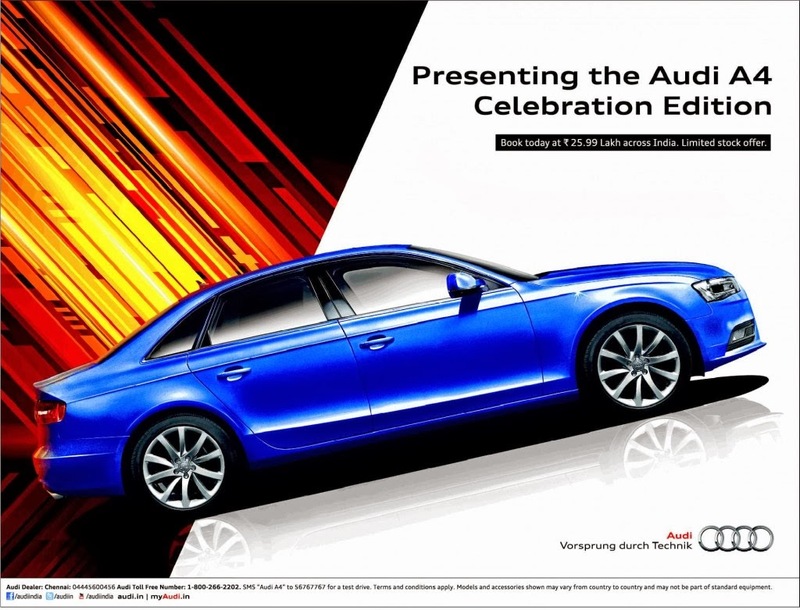 With another facelift, Audi A4, launching a Celebration edition, the carmaker is actually trying to grab more attention and therefore more of the customers to its kitty. The new car - A4 Celebration edition, which we would actually call the "Corporate edition" is a trimmed down version of the ongoing regular A4 on sale. The new car misses out on features like Sunroof, power folding mirrors, 17" alloy wheels replaced by 16", Cruise control and wooden trimmed dashboard. The front passenger seat also lacks the automatic adjustment of seats and does away with the manual option only. On the mechanical front, the car gets lower spec 2.0L TDI engine which produces 143 bhp rather than the higher spec 177 bhp version. The 143 bhp version of the 2.0 TDI will do the 0-100 km/h sprint in 9.1 seconds, hit a top-speed of 210 km/h and return 16.55 km/l. Since its a non-Quattro version, power goes to the front wheels via a CVT gearbox. The Celebration edition would be available only in "White" color and only a certain number of units are available on sale. The new car is available at a price tag of INR 25.99 Lakh.